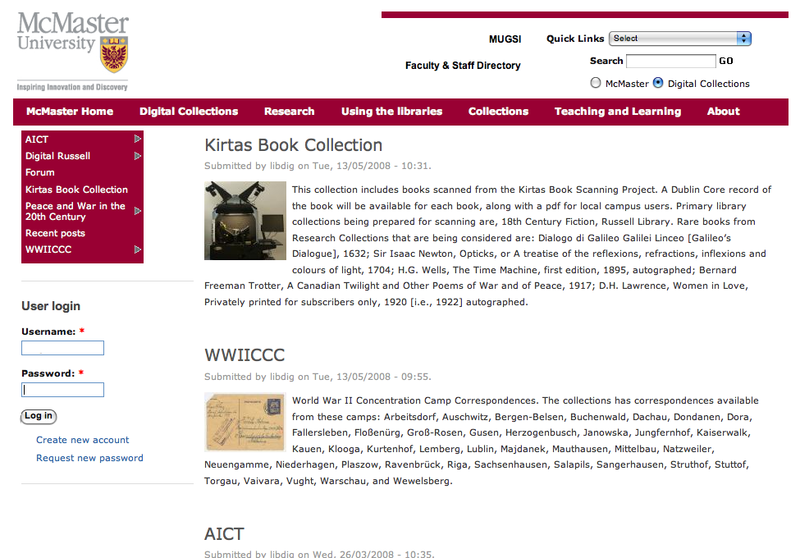 Ok, the Digital Collections website is ready for beta testing. Registered users can comment, vote on comments, and tag records - and updated version of the “bookbag” will be added soon. Collections with content include; Peace and War in the 20th Century, Russell Library, and World War II Concentration Camp Correspondences. 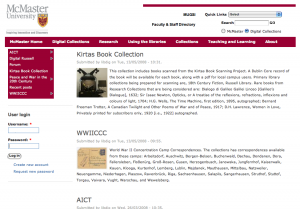 At this time, AICT, and Kirtas Book Collection are outlines for content to be added later. For the technical nerds! The site runs on Drupal, and takes advantage of the CCK Module. Each collection has its own content type, allowing it to expose its own unique metadata. All of the collections share Dublin Core fields, which combined with a modified version of the OAI2 module, provide OAI2 compliance. As of the right now, there are approximately 165,000 nodes - with the great majority of those records being an experimental version of BRACERS (more of this some other time).